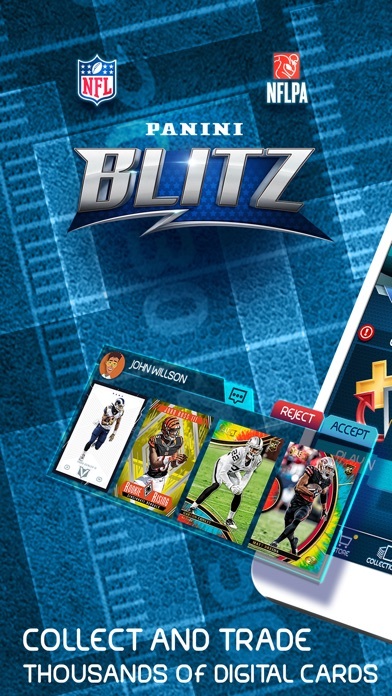 Collect, trade, play & dominate the league with NFL Blitz! 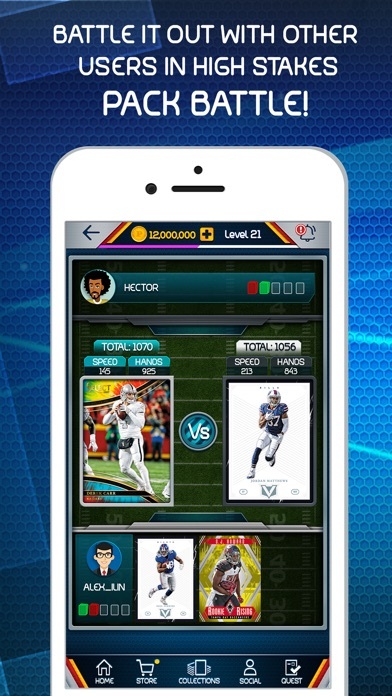 The only exclusive and officially licensed trading card and collecting app of the NFL and NFL Players Association! 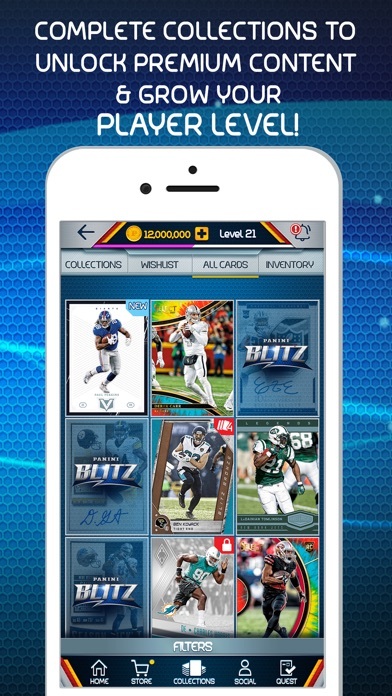 NFL Blitz, the first of its kind digital trading card app, let’s you collect thousands of officially licensed digitally autographed cards from your favorite stars and rookies, cards with pieces of memorabilia swatches (just like the real thing), and rare cards and inserts in multiple colors. 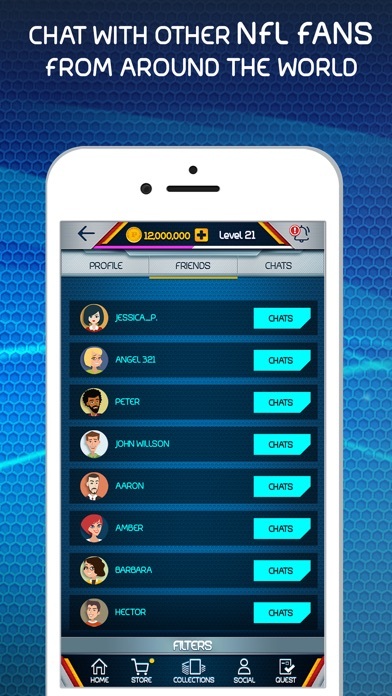 Be the GM and use your collection to enter real time contests, your cards score points as the players on the field do. Chat with, browse inventories, make offers, and trade with NFL fans from around the globe. 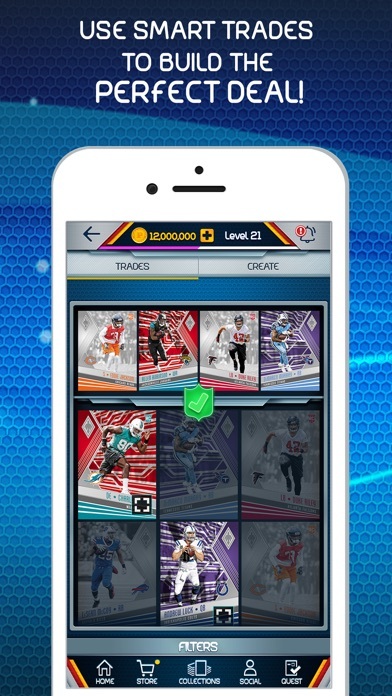 Trade up to 16 cards at a time to collect your favorite players, complete sets, acquire rare cards, or build your ultimate contest lineup. 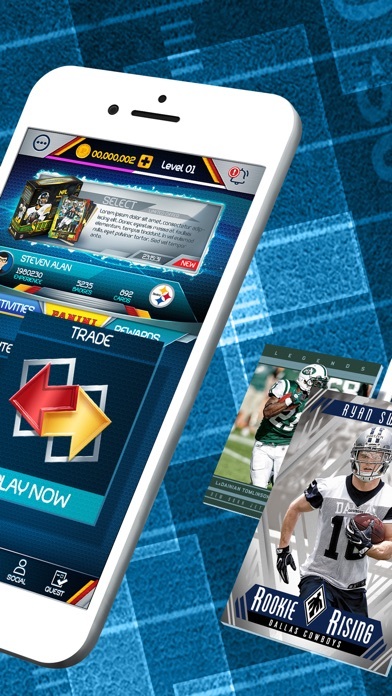 Get free coins every day just for signing in, and earn free packs, rewards, and coins for completing sets, making trades, scoring in contests and so much more! 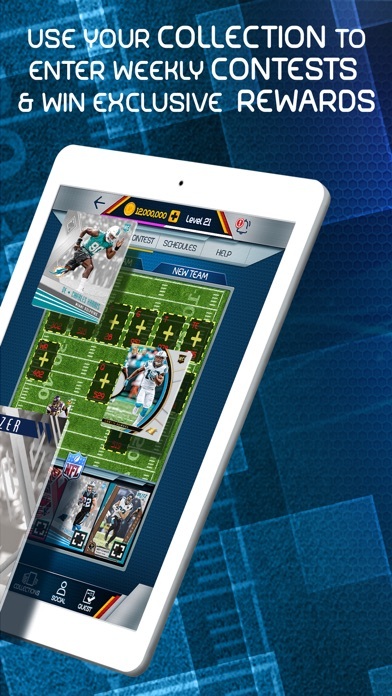 New digital cards from Panini’s physical NFL trading card brands like: Score, Donruss, Certified, Contenders, Select and high-end products like National Treasures and Flawless and more are released daily! Find rare and limited inserts tied to special events and key performances, and collect exclusive Panini Instant inserts which feature cards of top performances from your favorite players just moments after they happen! Panini blitz is a fun very fun game to play Except for the fact that that some of the packs cost 20$ which is a very high price to pay. But overall I really like the game but I really miss a feature that the game had awhile ago it was case breaking which was my favorite thing to play in the game but i don’t see it any more. Will it come back? I bought new iPhone-downloaded app, guess what-when I connect through FB it wanted to make me a new account which means I lose ALL my cards from the app-and I’m a paying customer but does Panini care when I leave message on FB or comment on FB page. NO THEY IGNORE YOU!!! Trust me, don’t waste time or money guys!!! I love the game but it won’t recognize my email address to let me log in. I can not save my progress please help! I tried logging in today and it says my account is deactivated. Why is this. Thanks. My game is registered to my Facebook my game name is ahauhuth. My app doesn’t work. App grays out once booted. I have an iPhone XR. Any insight from developers? As I buy real cards all the time it’s truly a bummer! I love the app but when I try to do the nickname it just refreshes and has me do it over and over again like I do calbronc4 and a picture and it just doesn’t work no one else used the user name and it doesn’t work. But again it’s a great app. For anyone who was on Gridiron, that app was killed off and your account transferred to Blitz. However, your actual cards didn’t really transfer. The card backs are different and worthless for retired players, many images were downgraded, card counts way off (as in significantly increased), etc. It was a great reminder that you ARE NOT paying for the cards but for the entertainment value of the app. So I would NEVER spend real money on this app! Especially since there is very little entertainment value here! No Scavenger Hunt like before. No releases with awards to chase. Trading is cumbersome, if not almost impossible. App navigation is terrible, etc. I even stopped logging in daily to get coins hoping for an improved app because your daily streak resets for no reason- very glitchy app, stay away! And sad thing is Dunk is even worse!! !